August | 2014 | Poverty, Agony, Distress & Want! You can’t learn history sitting there! So, where are we? Well, we’re past the mid-point of August, and you know what that means. Yup, it will be time to head back to work soon…sigh! I know, poor teacher, had the whole summer off and now it’s back to reality. I realize it’s hard to get people to sympathize with our situation, but I think it’s a little different for teachers. You see, I still have two weeks left on my vacation but my brain is already thinking ahead to what needs to be done to be ready for the first day/week of school. I don’t know that many other people do that same sort of thing. Now one of the things I need to start gearing up for is football, which as you know combined with work, makes my life go from the proverbial 0-60 in a matter of a few days. Schedules are already out and I have a coaches meeting on the books for next week. The trick now is to get my brain, which has been focussed on anything but football for the last two months, into that frame of mind. I really don’t even want to think about it right now, but as usual things will kick into gear as our start date approaches. So this summer is the second year in a row that I haven’t spent a whole lot of time in the bush doing railway field work. There were the few days in July following my presentation at the Chik-Wauk that I was able to get out, but that was about it. With that in mind, I decided to get out again a week and half ago to follow up on a few things I missed on that earlier trip. This time was going to be just a day trip, so it was a bit of a challenge making sure I had maximum time on the lake. That meant leaving pretty early, since it takes 2.5 hours to negotiate the round-about journey from Thunder Bay to Gunflint Lake. I would also have the boys with me this time, so I would have to keep this in mind. We were up and on the road early, so we arrived at our launch point, the Cross River Lodge, by 9:00 local time. A short time later we were zipping across the lake at maximum warp, which is about 21 knots for my boat (39 kph). I know the boys really enjoyed this part, since the lake which our camp sits on is pretty small, so we really can’t open up the throttle for very long. 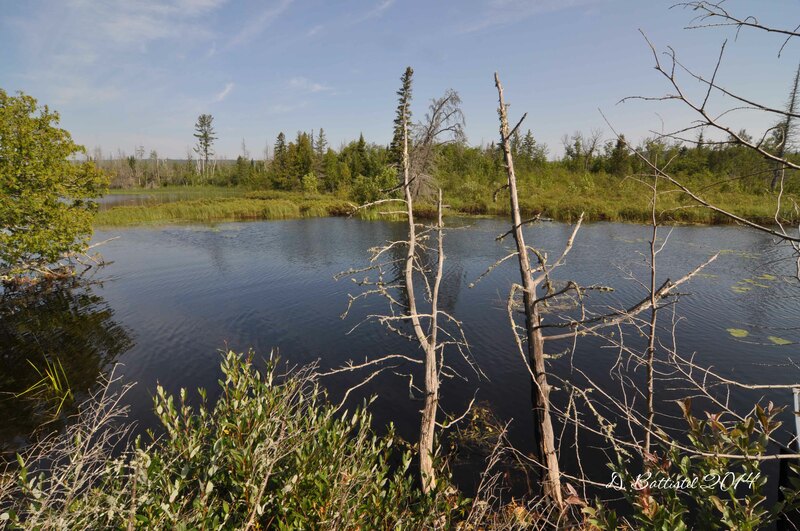 Our first stop of the day was going to be the spot where the Gunflint & Lake Superior crossed a small, unnamed river just south of the international boundary. I wanted to see if I could locate more of the bridge pilings and pick up the right of way on the south side of the river. The lake was fairly calm, so we were able to see some of the pilings under the water and get some good shots of them. Hopefully the water levels will drop a bit next year so I can re-shoot this area with an even better view. After studying the maps and Lidar in a bit more detail, I was able to follow the grade on the south side very easily. The pilings there were now part of a beaver lodge, but I was able to beach the boat successfully. I only followed the grade for about 80 metres since the boys stayed in the boat and I did not want to wander too far. I should be able to follow it fully when I am there in the fall. G&LS river crossing looking north, August 2014. Our next stop was going to be a nice beach southwest of the river, near where the Pigeon River Lumber Company had its logging camp, known as Camp Four. 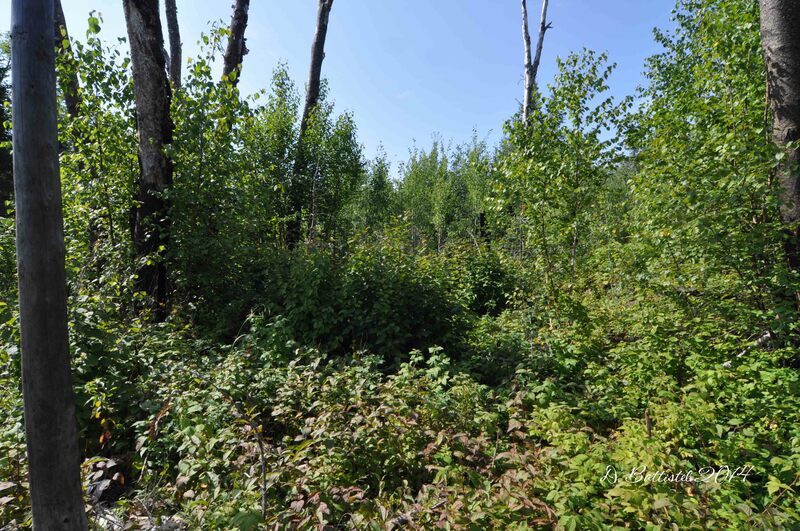 The plan was going to be to follow the grade as it made its way southwest toward the log trestle and the big ridge on the south side of Gunflint Lake. 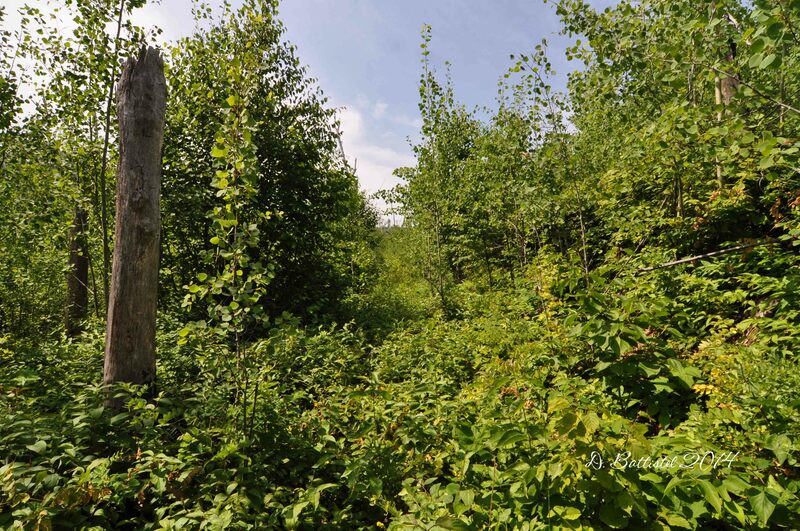 We would walk about 500 metres and attempt to locate some rails that were still in their place that I had seen in 1997. Unfortunately my plan came unglued pretty quickly. After securing the boat, the boys and I moved off the beach, found the grade and started our hike. After about 100 metres we ran into a snag; just east of the beach the beavers had built a large dam, flooding the area in front of what is known as Saucer Lake. With the high water levels this year, the dam had now flooded about 80 metres of the grade as it skirts behind a ridge. No problem right, just detour above the rail line? Unfortunately that didn’t work too well since the area is littered with deadfall from the 1999 windstorm and 2007 fire. By myself I would have been okay, but the boys are still young and they could not walk through all the new growth of bush and avoid the fallen trees. Back to the boat we went. Plan B was going to be to walk down the beach a bit then cut across the ridge and try to get on the grade that way. We did do our best, but it was just too difficult trying to get over that ridge. Seventy metres or so doesn’t seem like much, and I would have had no issues by myself, but again the boys are too young to handle that type of serious bushwhacking. Plan C. So my next thought was to take the boat about 500 metres or so further west along the shore to a point where the railway passed close the edge of the lake. We would still have to climb over the ridge, but I was sure this time we could just go straight over and not have to worry about any wet areas. As it turns out where we decided to beach the boat was a back country campsite, so the shore area was already cleared. It was about 90 metres to get up and over the ridge, but once we did, we found ourselves standing on the G&LS grade. After the first few failed attempts, luck was on our side this time. 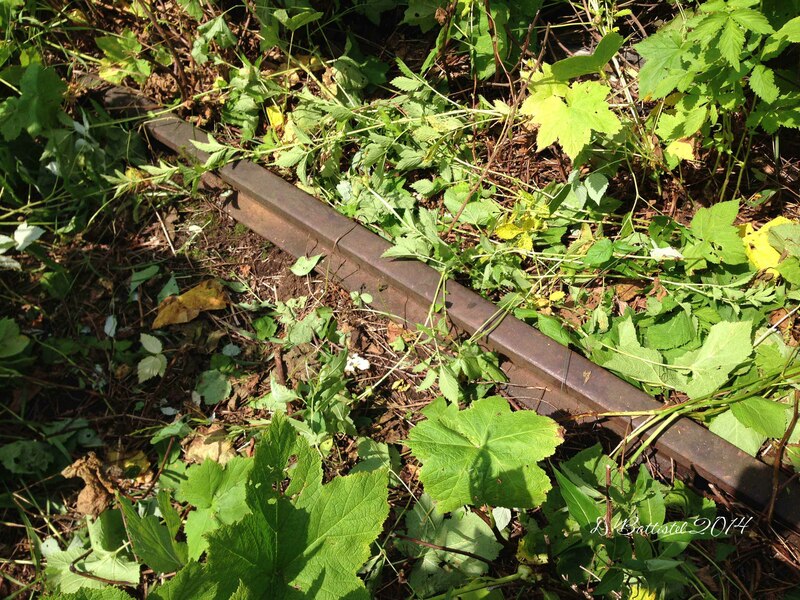 Within the first few metres of walking the grade, Noah announced that he had found a rail. We had come down right in the spot I was looking for! 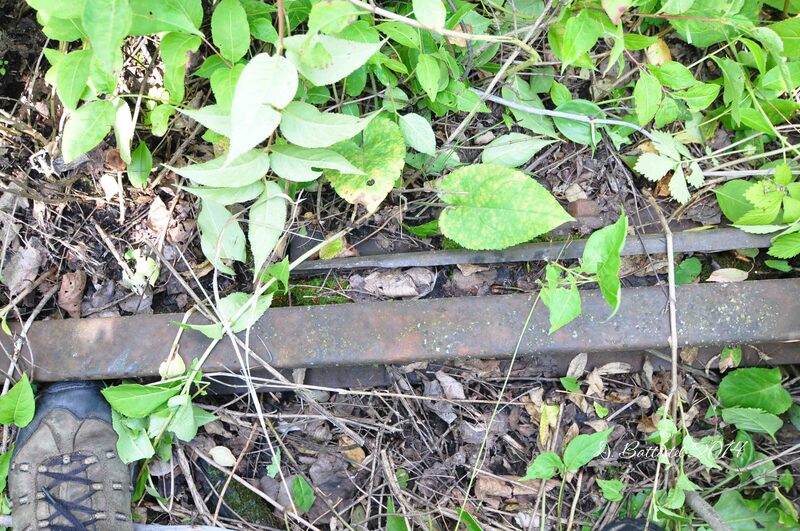 In this area there are a few lengths of track still in place, the rails joined by two-bolt fishplates and marked “Illinois Steel Co. Union 92 IX.” Even more remarkable, we found what appeared to be metal ties under the rails. 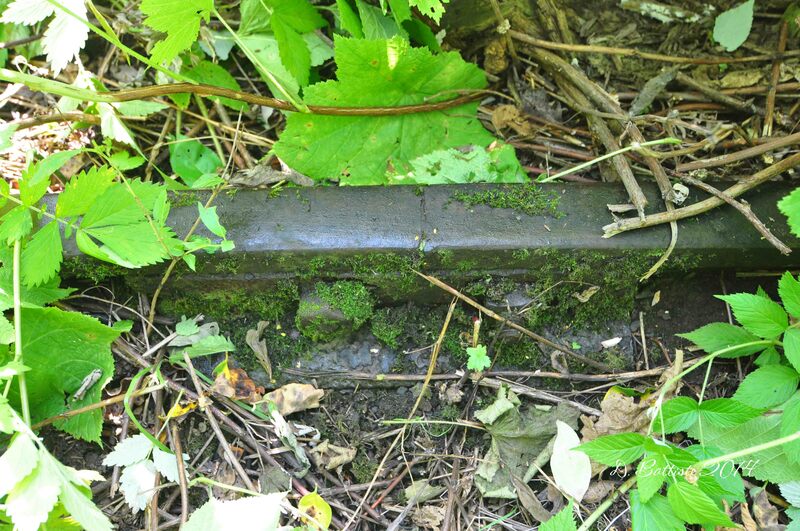 As it turns out, these metal “ties” were probably designed specifically for logging railways, so that the rails could be laid and then easily removed and used elsewhere. Rail & connector, August 2014. The grade in this area seemed pretty decent to negotiate, so I decided we would continue to follow it until we reached the log trestle, which was about 450 metres to the southwest. A little further along the grade, it was Ethan’s turn to make a discovery. This time it was a set of double tracks, which left me scratching my head a bit; I had no idea what the purpose of this might have been. It only took a few more steps along the rail to figure out that this was a junction, complete with parts of the switch. Where this spur might have gone from there was a bit of a mystery. We made our way to the bottom end of the trestle, the whole time noting how quickly the grade rises in a short distance (about 3-4%). It was very breezy on the lake, but stifling hot in the bush, so it was time to head back. I am really looking forward to going back in the fall and re-examining everything once the leaves are down and the visibility improves. Hopefully the weather cooperates and I’m able to accomplish all of my hiking. 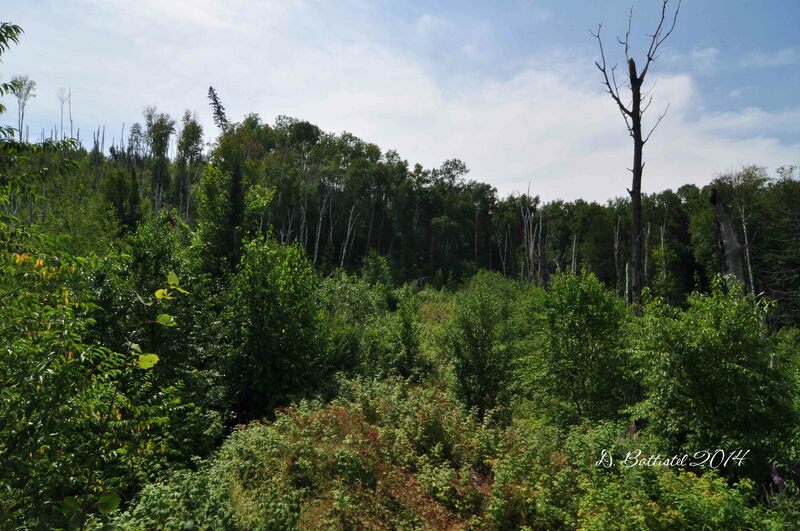 North side of the log trestle looking south, August 2014. So along with this field work, I’ve been spending a lot of time online, searching for material for the article I would like to write on the Gunflint and Lake Superior Railroad. My efforts have yielded quite a bit of information, and my file on this small logging railroad has very quickly expanded. I always quote this biblical line from the Gospel of Matthew to my students and they are certainly words to live by, especially as a historian-“seek, and ye shall find!” There is still much to do before I can even contemplate writing, but I have made a lot of headway. Now one of things that has helped me out a lot is a little field work of a different type I did last week. One of my great guiding sources for this project is the history of Cook County, Minnesota, “Pioneers in the Wilderness,” which was written by Dr. Willis Raff in 1981. I had the good fortune to meet and chat with Dr. Raff back in 1997 before his passing in 2002. His book, which includes a chapter about the G&LS, has given me a lot of direction as to where to look for information. One source that Dr. Raff used was a series of letters written by Pigeon River Lumber Company president Daniel J. Arpin known as the “Arpin Papers.” At the time of his research, these papers were in the personal collection of Lloyd K. Johnson, who was an attorney in Duluth, but originally hailed from Grand Marais. Johnson passed away in 2007, but with a little bit of digging I found that these papers were now in the possession of the Cook County Historical Society in Grand Marais. So last Thursday I went to take a look. I don’t think I really understood what I was in store for when I decided to take a look at these letters. 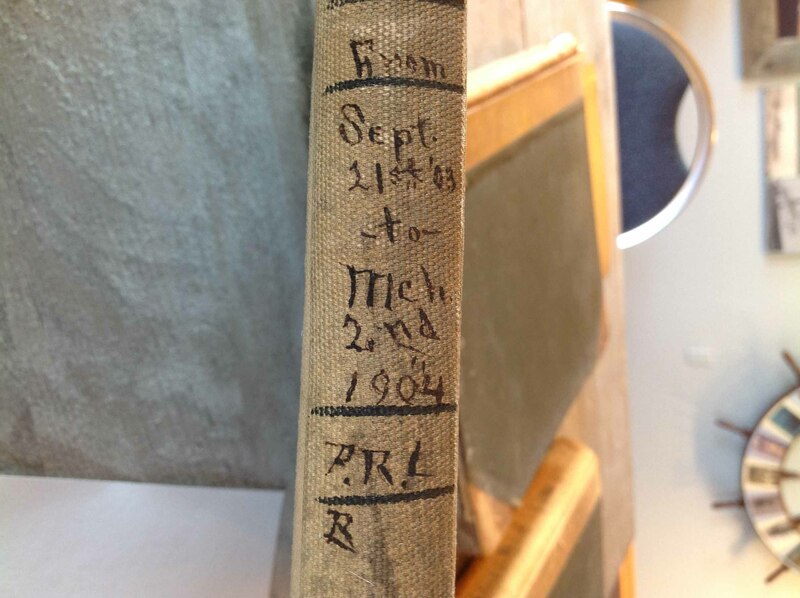 Raff stated that there were 9 volumes of letters, with 500 pages per volume…that’s 4500 pages! He said they were on “onion-skinned” paper, which really meant nothing to me; it only took me a few seconds to figure it all out! The letters are actually carbon copies of his correspondence with friends, associates and businesses. The vast majority are typed, but since they are carbons, the paper is tissue-paper like (hence the onion-skinned) and the text is purple. Some are easy to see, some are quite faded. These letters were a gold mine of information, and I am very thankful they are still around. However, between the purple text, fine paper and the sheer quantity pages, I was bug-eyed and exhausted at the end of the day. It took me seven (yes, seven!) hours to go through 4 of the 6 volumes they have accessible (not all of the collection is catalogued…I’m hoping they have the other 3 volumes). I will need to make at least one more trip back (maybe two) to get through the rest of the books. That was just to look at them all though; I photographed the pages of interest on my iPad and now I need to go back and make notes from them!